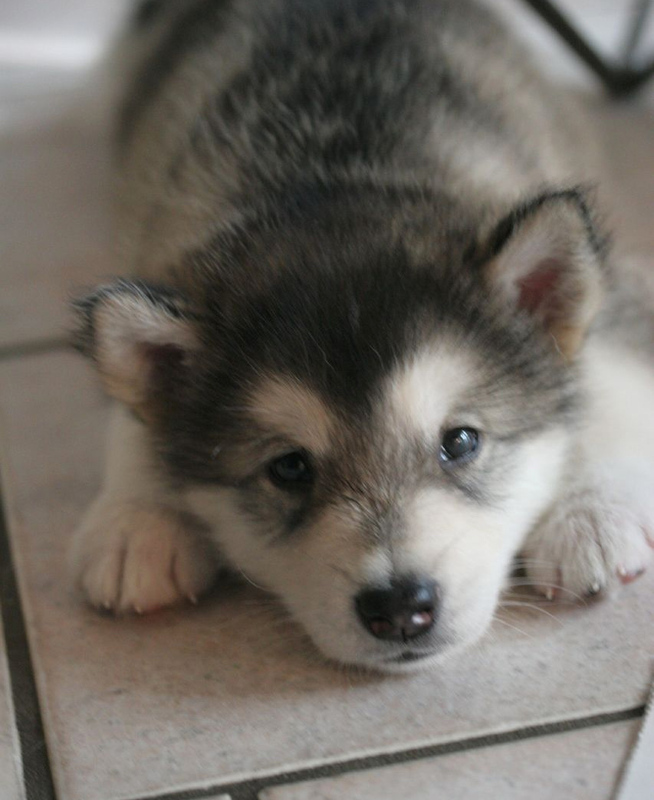 Alaskan malamute puppy; official state dog of Alaska. Photo by MaartenB/Flickr (Noncommercial Use Permitted with Attribution/No Derivative Works). The students at Polaris K-12 School in Anchorage performed a multi-year study comparing the different dog breeds to put forth in this bill (sponsored by Representative Berta Gardner). The Alaskan Malamute won hands-down over other dog breeds because it has the longest history, dating back to the first settlers on the North American continent (at least 5,000 years as noted by archeologists). Alaskan malamutes contributed to every era in Alaska's history, and they are still actively used in arctic expeditions today because they can withstand the cold temperatures without booties, coats, or bedding straw (dog mushing was recognized as the official state sport of Alaska in 1972). Another contender, the Siberian Husky, was not imported until 1908 when gold miners were beginning to race their dogs for sport and wanted to develop a smaller, faster dog. The Malamute was a freighting dog, not meant for sprinting. In the Alaskan Malamute’s 5000 plus years in North America, it's been involved in every important era of Alaska's history. The Alaskan Malamute, one of the twelve ancient breeds and one of the oldest Arctic sled dogs, was named after the native Inuit tribe called Mahlemuts, who settled along the shores of Kotzebue Sound in the upper western part of Alaska, within the Arctic Circle over 5,000 years ago. They worked closely with early the Arctic settlers to hunt and track and pull heavy sledges loaded with supplies. They kept a lookout for bears and guarded the caribou herds. They even baby-sat the Inuit children while parents were out on hunts, which is one reason they make very good family pets. They were so gentle that they allowed the human babies to crawl in and snuggle up with their puppies. Their use of dogs was a partnership for survival. The journals and logs of Captain Cook and other European explorers to Alaska showed that they were VERY impressed by the big, strong, hardworking Alaskan Malamute who got along and worked so well with humans. They note that the dogs kept by the Mahlemut people were better cared for than was usual for Arctic sled dogs, and this seemingly accounts for the breeds affectionate disposition. Travel logs of the early Russian and English explorers often reported a superior and better kept type of work dog kept by the Mahlemut people. They wrote about them being less “wild”, more friendly and easy going, and capable of an enormous amount of work, both hunting and hauling. Long after the Gold Rush, Alaskan Malamutes continued to be valuable freight dogs. They were easy to care for and could pull very heavy loads to areas that were otherwise not accessible. Often, they carried a thousand pounds of mail at a time, and it is said they would arrive in Nome, frisky and ready to run again. Their efforts helped to open up Alaska for settlement and development. By the time of the Gold Rush, Alaskan Malamutes, with their ability to haul equipment and people, were in high demand. They were so highly valued that a prospector would pay $500 dollars for one good dog and $1500 for a small team! Alaskan Malamutes contributed to the polar expeditions of Perry, Amundsen, and Byrd to the South Pole. They were employed to pull the heavy supply sleds. The successful exploration of this vast continent could not have been accomplished without the help of the Alaskan Malamute. They were able to work for weeks on end without negative effects of the daily strain. They still actively do this work today. During World War I., the Alaskan Malamute was called into service by the French army where troops in far-reaching mountain outposts were surrounded and cut off from supplies. The Nome Kennel Club shipped 450 Alaska Malamutes to France where the dogs easily tackled the harsh conditions and moved needed supplies to save the day. Alaskan Malamutes participated in the historical 1925 Serum Run to Nome, a fact that most people do not know. The Alaskan Malamute was important to America’s efforts during World War II. They pulled sleds in snow covered areas that were not accessible to other, more mechanical means of transportation. They were used as pack animals to carry weaponry and ammunition, served as search-and-rescue dogs, and sniffed for mines. The military tried to make the Alaskan Malamute guard dogs, but they failed the test because they just liked people too much to attack a person. Alaskan Malamutes provided transportation for Ernest de Koven Leffingwell’s pioneering mapping of the Arctic National Wildlife Refuge geology and the Arctic coastline. They were there when Leffingwell first speculated that Prudhoe Bay would one day become what it is today…the largest oil field in North America. 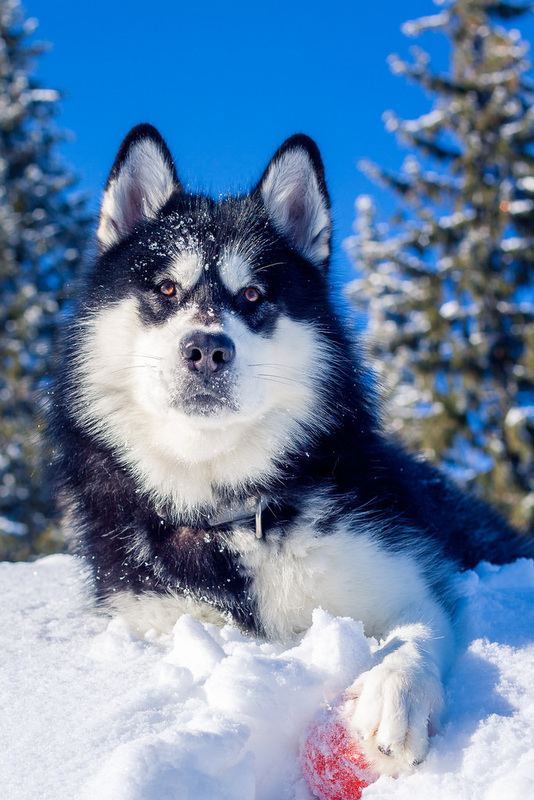 Denzel the malamute; a perfect portrait of Alaska's state dog. Photo by Sergii Gulenok/Flickr (noncommercial use permitted with attribution). 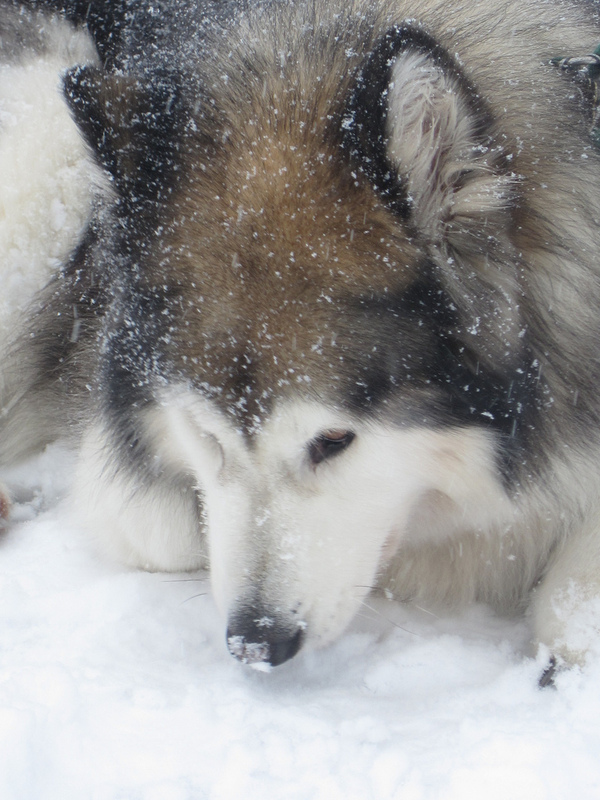 Alaskan malamute; enjoying the snow. Photo by essgee51/Flickr (noncommercial use permitted with attribution).